Was born on August 13 1971 in Minsk . 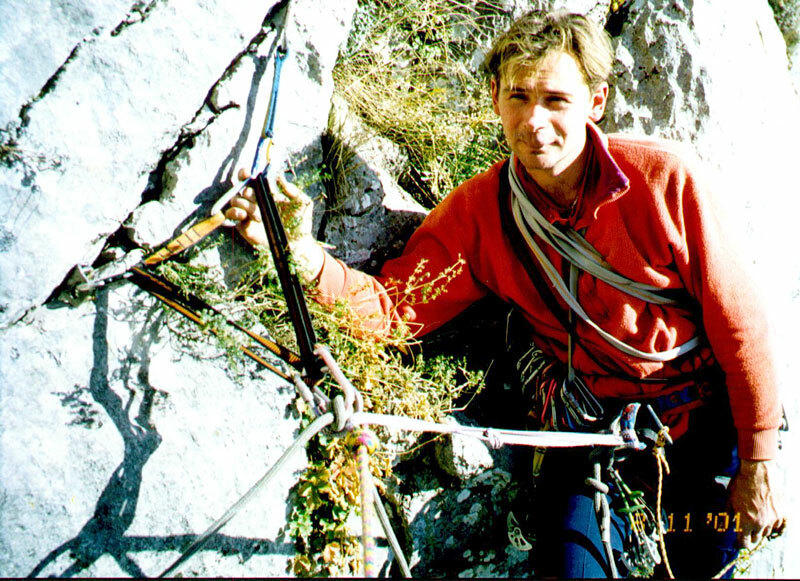 Started to ascend and climb in Minsk in 1991. Made 23 ascents 5-6 gradein big mountains. And more than 80 ascents 5-6 grade in Crimea . Bashkara (6 А , Lifshitc) in party of two. Shkelda (6 А , Subartovich) In party of two. Bashkara (6 А , Grigorenko-Pria). Central Dolomit by the Western wall (YU.Melnik, 4 Б ) . The ascent was made on August 1 and took nearly half a day. On the difficult sections he used rope, successively fixing the points. Fot belay he used a slightly remade gri-gri. 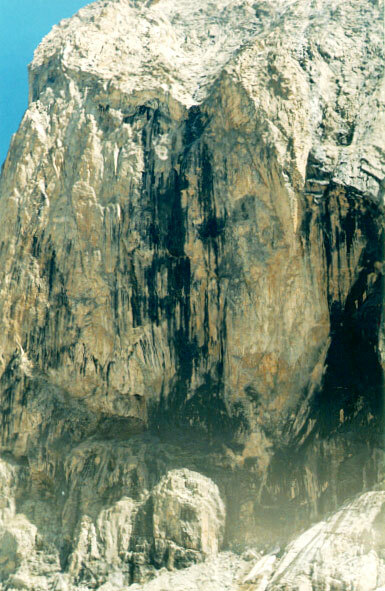 Northern Dolomit by the center of the bastion on the Western wall (M.Rubakov, 5 А ) . was made on August 2 and took nearly a day. Peak Kirpich by the " Rhomb "the Western wall (YU.Manoylov, 6 А ). The ascent was made on August 15-16. On August 15 at 4 AM he left Uzunkol. In 3 hours he reached the wall and started to climb. He spent night on the small ledge in two ropes before the bend of the wall. On the next day he reached the summit. He descended by the 1 grade to the Dalar pass and in the same day he descended to Uzunkol.. 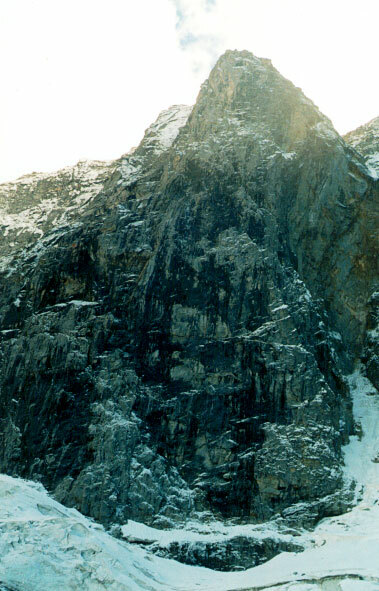 The ascent took place in February 2000 and took three days. In the first day the rope was fixed till the grotto and a rope above. Hard, but without anguish. For night descended to the house under Big Kilse. In the morning ascended the fixed ropes. 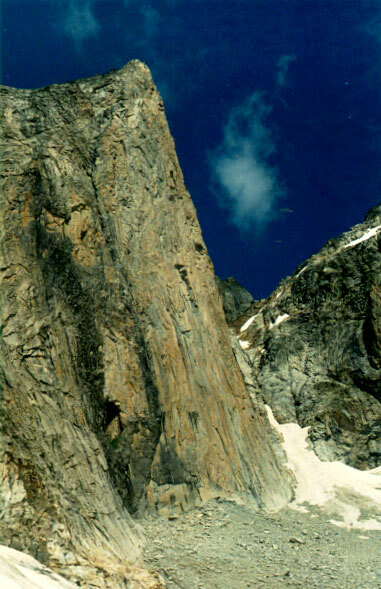 Further there were two pitches of various artificial climbing. It began raining. But while the rock overhung, there weren't many problems. When the terrain became easier and it was free climbable, the rock was wet and mossy (slippery). I reached the ledge, going through all the wall, where technican difficulties end up. I descended for the gear and went upwards. Stent night on the ledge in the grotto. The night was unplanned, that's why it was cold and very hungry. In the morning the rain continued. I crowled to the left along the ledge, one time I fell, but stopped on a friend. I crowled to the overgrown easy rocks with difficulty. The question arose: to belay or not. 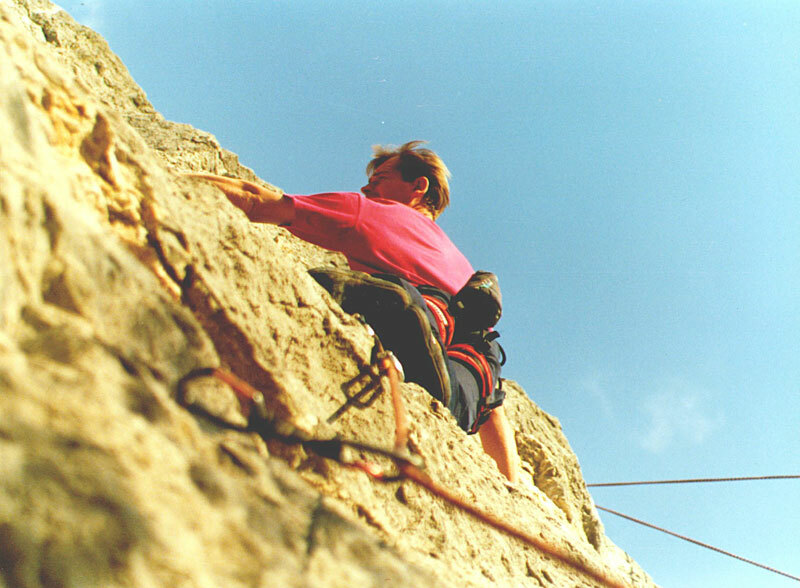 If I belay, it could be too slowly and I could not end before dark. If not, it was too slippery. I chose a combined variation. Under the top I incorrectly chose the direction and I had to climb a one more difficult pitch to the upper tower. But everything comes to an end, I was on the top and descended before the dark. Several days were spent for the acclimatizing and climbing. Then we planned to ascend Kirpich by the Southern wall (5 Б , Rujevsky) , a day of rest, Shokoladnuy (5 Б , Despye). On the fourth day I left the camp. My rucksack was very hard. I spent nearly a day to reach the nights under Shokoladnuy peak. Lack of acclimatizing took an impact this way usually takes 3-4 hours. I was there at nearly 4 hours. In the morning I Ascended by the ice-snowy slope to Dalar pass, successfully bypassed bergshrund. Then I descended to Svanskaya area, bypassed the mountain and went to the wall. It took more time than I had planned, and I was tired. I began to climb. Ascending the lines with a rucksack was exhausting. I was thirsty. But I had only one 1-liter bottle with water, if I could return this day. Technical difficulties of the route didn't take much attention, the route was familiar. When I reached the control point (approximately the middle of the route ) I realized that there was no water on the route. In the twilight I reached the roof. But the peak was familiar (I had been there twice) – a huge stone-sliding area. At 22:00 I ascended to the summit, left a note. Descent wasn't difficult - 1 Б . I descended to the pass, after midnight I was on the moraine, and long time couldn't find my tent in the darkness. I spent the whole next day lying. But after the rest I decided to ascend Shokoladnuy. In the morning I went to the wall. Though I had ascended the route before, I didn't find the beginning at once. Soon I understood that a day of rest wasn't enough after the first ascents. After the rest I planned the route of Varburton-Grakovich by the bastion to Dalar (6 А ). I started from "Uzunkol. At 4 AM I left the camp. I climbed 4 pitches, ascended to the ledge with a good area for a tent and control point, and a piece of old ice, it could be no other water. I fixed two ropes above the ledge. In the morning I started to pack. After nearly a pitch I met group Djaparidze. They offered me to bypass them. After 3 pitches I was on the grassy ledges with streams, grass and butterflies. Here the second night was. With first sunrays I started to climb. I passed about 6 pitches. The sun was hot. I reached the ridge and went along it to the peak tower. Then I ascended to the summit. Now it was time to descend. Apseiling was difficult, the rope moved hard. But the couloir ended and easier way started to Dalar pass. Without any problems I bypassed the bergshrund and went to the glacier. Happy end. Later I decided to ascend on Dalar by the bastion of the northern wall (the route of Korablin, 6 А ). On August 14 the weather became better, and I left the camp. In a couple of hours I reached the place of night - on the opposite side of the bastion through the glacier. In the morning I started to ascend and reached the wall. The beginning isn't too difficult. But moving upwards-downwards all the way was rather hard. There was one place where I needed a sky hook because a bolt placed by the first ascenders disappeared and left only a hole. Then the rain began. Firstly I tried to climb under the rain, but the terrain was difficult and I had to refuse this idea. This day I climbed 4 pitches. In the morning the weather improved. After 4 pitches I reached the bend of the wall. Here on the good ledge I decided to stay for night, and then fixed 2 ropes for the next day. Five pitches I went upwards-downwards and ascended on the bastion, under ice and snow place. Under the upper tower I left my rucksack and ascended on the summit. I wrote a note and went downwards. The weather became worse. In the morning I descended to the camp without any adventures.